Life Is Going To Be Beautiful in October in 2014 . 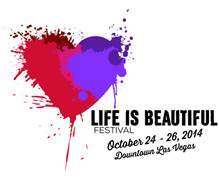 The inaugural Life is Beautiful event in 2013 was a fabulous success. So much so it’s coming back even bigger in 2014. It was recently announced that it will return to Downtown Las Vegas in on October 24-26. Over 60,000 people enjoyed Life is Beautiful in its first year last October, exceeding original estimates for the festival. Attendees spent the weekend exploring 15- city blocks programmed with music, food, art and learning experiences for all ages. Held over two days, the inaugural event consisted of five music stages, a culinary village, an alchemy garden, an eclectic street art program, a learning program with a range of notable speakers and much more. We are marking our calendar now for those October dates for what promises to be another 3 days when life is truly beautiful in Las Vegas. 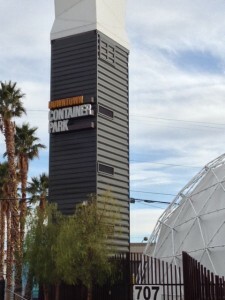 The Downtown Container Park Adds More Excitement to Down Town Las Vegas . Las Vegas, home to most every celebrity chef you can conjure up both on and off the small screen is known as a culinary destination for their gastronomic delights. Before there was the glitz and glitter of multinational gaming corporations building palatial resort casinos on what became the “strip”, there was downtown and Fremont street where Las Vegas really began. Sadly, for many years, its casinos where old time gamblers spent their last penny and those that did, found a home in an alley or under an overpass abiding their last days. Yes, it was a sad place, a tourist haven and even dangerous if an unsuspecting, inebriated guest wondered a little too far away from the relative safety of the dimming lights of every imaginable color. But then came entrepreneur billionaire Tony Hsieh who built Zappos, rode into the city like a knight on a white horse to literally save the day, moving his headquarters and employees right in the middle of downtown and creating his Downtown project. This self-made billionaire is continuing to change the downtown area building by building, block by block and even container by container. 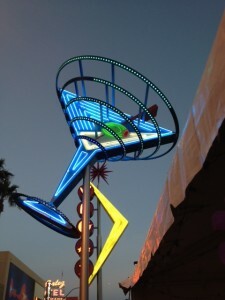 Recently, The Las Vegas Container Park opened on east Fremont street, a street that just a few short years ago was home to dilapidated small motels of questionable nature. Today this same area features small locally owned restaurants, bars, boutiques and coffee houses supported by Zappos employees who live in renovated, chic apartments that were once uninhabitable. The word has gotten out and now Zappos employees , locals and tourists alike drink, sip and dine together just as Tony Hsieh in visions on what he calls “collisions “. 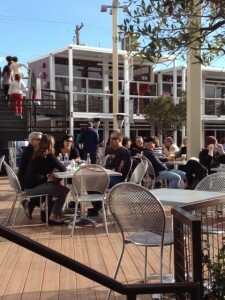 The Container Park was made as a place for start up companies to gain some traction. On opening day, there was a line outside and has been a hub of activity ever since. For example, there is Big Ern’s that began as a catering service and now it has a brick and mortar location or shall we say container location. The park features 43 retail business, restaurants, bars, a playground that has a shipping container converted into a 30-foot-tall treehouse with three slides, observation tower, and stage that showcases musicians throughout the day and into the evening. What IS a Container Park you are most likely asking by now? Downtown Container Park is about 19,000 square feet, a mix of 30 shipping containers and multifunctional modular cubes forming its boundaries. The cubes are steel-framed and encompass 250 square feet. The entrance features a pretty famous insect. 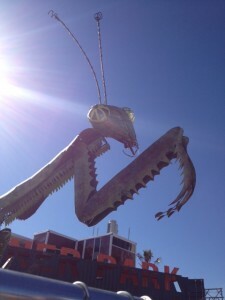 A 55-foot-tall steel praying mantis sculpture built atop a dump truck greets each and every guest. Artists Kirk Jellum and Kristen Ulmer made the piece for Burning Man, an art festival held in the Black Rock Desert of Nevada. At night “The Mantis” shoots flames from its antennae to the amazement of all from blocks away. Keeping in the entrepreneurial spirit, the Container Park isn’t intended as a permanent location for businesses. It’s intended to give start ups a chance to thrive and find bigger, permanent locations. There are plenty of those in this one of a kind venue. 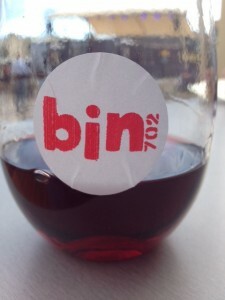 We highly suggest BIN 702 for the oenophiles. Enjoy one of the most comprehensive selections of wine on tap in Las Vegas , take a prime seat on the patio, and enjoy live music from the stage very nearby. Of course you need mouthwatering bites to enjoy with your wine. Bin 702 offers a wide array of artisanal cheese, meat plates, salads, and paninis. The word here is sustainable, with dressings and aiolis made from scratch on-site with the best domestic and imported ingredients available. 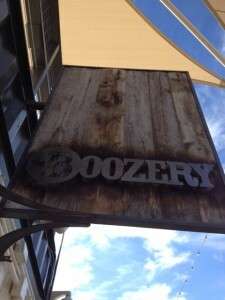 If in the mood for a Martini , stop into The Boozery . We love this unique cocktail lounge in a shipping container. As they say themselves, “No name has ever been more appropriate “. 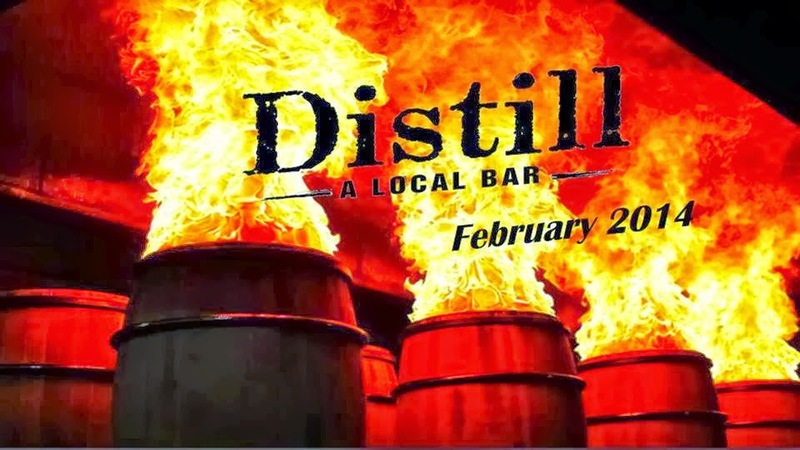 Enjoy local spirits and beer inside or outside the container on their deck. We mentioned celebrity chefs on the strip earlier, why not stop into Pork & Beans which is a collaboration of Future Restaurant Group and celebrity chef Kerry Simon. The menu is small but Chef Nona Sivley plates up fresh Pork & Beans, artisanal sausage and bean dishes as well. In addition to pork, beans, cheese and booze we also recommend Simply Pure. This is a really cool gourmet vegan raw food venue. Enjoy fresh organic ingredients that you will not be disappointed in. 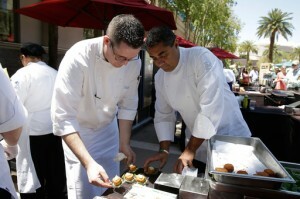 It’s that time of year again, The Eighth Vegas Uncork’d By Bon Appetit Tickets Are Now On Sale. 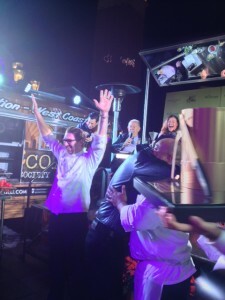 For the last eight years we have waited with anticipation for Bon Appetit Vegas Uncork’d . The wait is now over .The country’s star-studded culinary festival all ways features extraordinary lineup of celebrity chefs , sommeliers and mixologists from renowned resorts, ARIA, Bellagio, Caesars Palace, MGM Grand and The Venetian. This year, mark your calendar on May 8-11 and plan to attend this four-day culinary dream celebration. 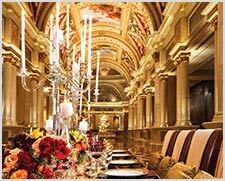 The 2014 Vegas Uncork’d will feature celebrity chefs Bobby Flay, Buddy Valastro, Daniel Boulud, Giada De Laurentiis, Joёl Robuchon, Julian Serrano, Guy Savoy, Mario Batali, Pierre Gagnaire, Masayoshi Takayama, Michael Mina, Nobu Matsuhisa, Royden Ellamar, Shawn McClain, Thomas Keller and more. Krug Chef’s Table at Master Series Dinner: Dinnertime Decadence with Guy Savoy, Thursday, May 8: Experience exclusive like never before and be one of six at the Chef’s table – the only portal into renowned chef Guy Savoy’s den at Caesars Palace. At the only Krug Chef’s Table in the U.S., guests will sip luxurious Krug Champagne and dine on a special menu prepared by the Michelin-starred chef himself. The Night Market: East Meets West, Thursday, May 8: Join top chefs from The Venetian such as Mario Batali, Thomas Keller, Buddy Valastro and Justin Quek, as well as the outstanding chefs from Singapore’s Marina Bay Sands as they bring the true night market experience to you with an array of Asian-inspired dishes and drinks. 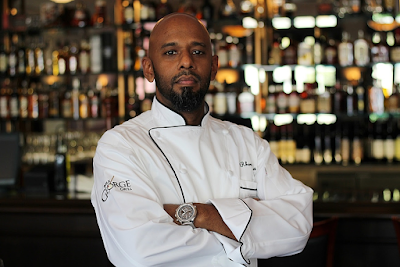 Second Annual Chase Sapphire Preferred Grill Challenge, Thursday, May 8: Two Le Cordon Bleu College of Culinary Arts students will get a once-in-a-lifetime opportunity to compete with two world-class chefs, including Buddy Valastro, from the hit television series Cake Boss. The teams will battle it out during The Night Market at The Venetian for a $20,000 scholarship, courtesy of Chase Sapphire Preferred. A Twist on Dinner: The Perfect Pairing of Shawn McClain and Pierre Gagnaire, Thursday, May 8: Join Mandarin Oriental’s Pierre Gagnaire, a Michelin three-star chef, and ARIA award-winning chef Shawn McClain as they put their signature fresh-flavor twists on a unique dinner featuring thought-provoking wine pairings. Sushi & Sake with Chef Nobu Matsuhisa, Friday, May 9: Culinary master and sushi connoisseur Nobu Matsuhisa shows lucky attendees how to roll sushi and sip the best of sakes at Caesars Palace. Discover his inventive “Nobu Style” that fuses classic sushi-making techniques with unexpected ingredients. The Perfect Pairing: Art & Wine, Friday, May 9: Soak up fine works of art while sipping an array of wine in this high-culture pairing from Bellagio’s Master Sommelier and Wine Director Jason Smith and Bellagio Gallery of Fine Art Executive Director Tarissa Tiberti. Michael Mina’s Poolside Pig Roast & Beer Garden, Friday, May 9: Michael Mina hosts a full-on outdoor shindig complete with succulent whole roasted pig, barbecue favorites, and plenty of ice-cold beers. Chill outside to the sound of upbeat live music and savor special dishes from Michael Mina’s PUB 1842 at MGM Grand. Legendary Lunch with Le Cirque, Saturday, May 10: Enjoy fabulous views of The Fountains of Bellagio during this extraordinary luncheon at AAA Five Diamond Award-winning restaurant Le Cirque. Executive Chef Paul Lee will create a spectacular four-course meal perfectly paired with wines hand selected by Flower’s Winery Master Sommelier Larry Stone. Fire & Ice: A Flame-Grilled Feast Over Cool Cocktails, Saturday, May 10: Royden Ellamar, Executive Chef of Sensi at Bellagio, will heighten senses as he explores the ancient methods of cooking meat with live fire, ash and smoke while Master Mixologist Ricardo Murcia cools things down with creative cocktails incorporating ice and fire by the pool at Bellagio. Prime beef and game will get charred by white oak embers while a whole lamb roasts over pecan logs. Farmers’ market vegetables will cook in the ashes of a smoldering fire pit and a bespoke ice smoking chamber will be filled with seafood and wisps of orange wood smoke. Mother’s Day Weekend Brunch, Saturday, May 10: Bring Mom to meet all-star chefs Shawn McClain and Masa Takayama at this chic day party at ARIA where guests will dine on a bountiful brunch paired with world-class wines. Grand Tasting, Friday, May 9: Enjoy a staggering variety of signature dishes prepared by the world’s most celebrated chefs. 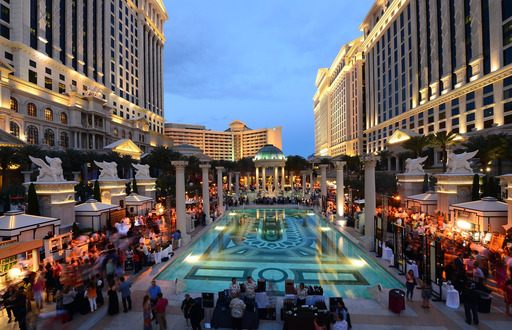 The dramatic five-acre Garden of the Gods Pool Oasis at Caesars Palace will feature more than 50 award-winning chefs and more than 100 of the best wines and spirits from around the world. The after party will be held at the newly opened FIZZ Las Vegas where guests can indulge on the best of champagnes and mingle with celebrity chefs all while enjoying the colored photography from the private collection of the lounge’s creative director David Furnish and Sir Elton John. 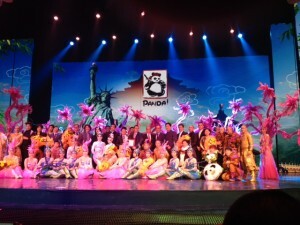 A World Premier Night at PANDA ! 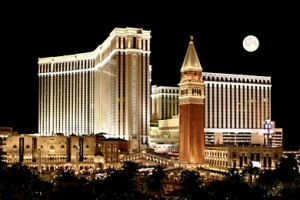 in The Venetian Las Vegas and The Palazzo Las Vegas Resorts makes Las Vegas History . 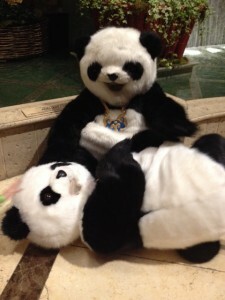 We were fortunate to have seen a preview of PANDA ! during the resort’s Winter in Venice Festival and were intrigued with what we saw. As the weeks went by we waited with great anticipation of the world premier and what a night it was. 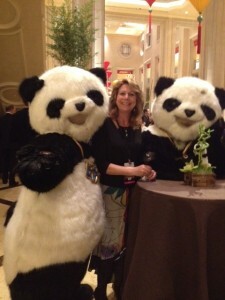 The opening night started with a reception hosted by our very cute and cuddly Panda friends. In addition to our hosts from the bamboo forests, many members of China National Acrobatic Troupe who are masters from the Shaolin Temple and the birthplace of Kung Fu greeted the world premier guests from Beijing and around the world. The Palazzo Theater was buzzing with excitement as guests took their seats for a first look at the newest show on the famed Las Vegas strip. The bamboo curtains opened and our journey with LongLong Panda began. LongLong, is a true Panda in every sense of the word with his warm and caring nature. The show takes the audience along on his mission to rescue his beloved and beautiful Peacock Princess from the evil and mean Demon Vulture, who kidnapped her on their wedding day. Heartbroken, LongLong seeks guidance from an Old Man, along with monks who specialize in martial arts to prepare the love sick panda for his mission to save his future wife. This incredible show features gymnastics from world champion artists, acrobats, martial arts, breathtaking dance, music and a multi-layered LED wall that runs the length of the stage. PANDA! is the classic story of good overcoming evil that takes the audience on an emotional roller-coaster leading to an epic battle where the victor gets the girl or in this case the Peacock princess. Director An Zhao and his team behind the opening and closing ceremonies of the 2008 Beijing Summer Olympics has done an amazing job with PANADA ! 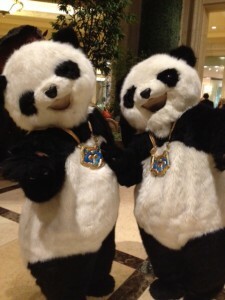 , the first-ever Chinese produced show to have a residency in Las Vegas. This show is unlike any show you will see in Las Vegas and will be a hit for young and old alike for years to come. A proposed change to the Sta Rita Hills AVA’s Boundaries ? We think not. We have been writing, traveling and interviewing wine makers in the beautiful Sta Rita Hills AVA for many years. In our opinion this unique AVA produces some of the finest Chardonnay and Pinot Noir in the country if not the world. Now a Santa Barbara County grape grower wants to expand the Sta. Rita Hills appellation to include his vineyards, but has met with opposition from those already in the appellation. Blair Pence, owner of Pence Ranch vineyard, filed a petition with the Alcohol and Tobacco, Tax and Trade Bureau to change the eastern boundary of the AVA. The expansion would extend the eastern boundaries to include three vineyards, John Sebastiano Vineyards, Rio Vista Vineyard and his Pence Ranch Vineyard. He owns 40 acres of vines selling grapes to local wineries for years however, because his land falls outside of the Sta. Rita Hills appellation he gets less value per ton. This renegade grower filed a petition, stating that his land’s soil and climate is similar to the established AVA. As expected the Sta Rita Hills Winegrower Alliance disagrees with Pence’s arguments. Wes Hagen of Clos Pepe who is the original petitioner who crafted the AVA boundaries points out in numerous interviews the new border would extend into a distinct landmass called the Buellton Flats, which has a north-south orientation, while the current AVA has an east-west orientation. In addition, the proposed areas lack the maritime influence that make the region ideal for Pinot Noir and Chardonnay. The Sta Rita Hills is a very special place and we have watched it grow first hand having walked many of the renowned vineyards in the area. If you spend any amount of time in the area, meet the winemakers who are still farmers and taste the wines from the region you will understand why the Sta Rita Hills current boundaries are where they are. 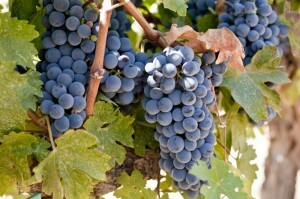 Recently new AVAs have been established in the area such as nearby Happy Canyon AVA. Why it was not added to the Sta Hills AVA? The answer is simple. It’s different. There are many micro climates and soil compositions that make up distinct terroir and that of course influences the grapes thus making them different from the same varietal literally grown just a few miles or less away. The Sta Rita Hills boundaries are there for a reason, founded by nature itself and should not be modified. “Chefs to the Max” dinner series to benefit Journalist Max Jacobson. 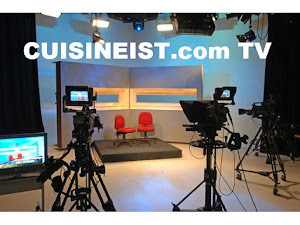 Being journalists based in Las Vegas we have long explained to visiting colleagues that Las Vegas is a small town and within that small town the food and beverage family is even smaller and very close. 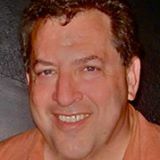 Our highly respected mentor and journalist Max Jacobson was critically injured in an accident and in intensive care. This “small town “has teamed up with a world class line up of Chefs that has never been assembled anywhere to support the family during this very difficult time. A benefit dinner to be held on January 19th will feature literally the world’s best in the kitchen. Chefs Akira Back , Megan Bringas, Bruce Bromberg , Kim Canteenwalla, Barry Dakake, Susan Feniger , Hubert Keller, Thomas Keller , Grant MacPherson, Brian Massie , Mary Sue Milliken , Bradley Ogden, Luciano Pellegrini, Joey Romano , Megan Romano, David Walzog, Rick Moonen, Bobby Flay , Saipin Chutima and more, will deliver a once in a life time dining experience . 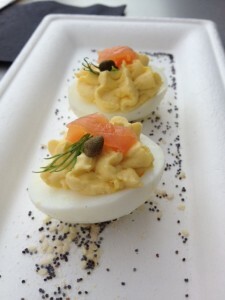 To find out about other “Chefs to the Max” dinner series events please visit www.Facebook.com/ChefstotheMax. Signature Cocktails , New Menu Items and Mixology On Tap at Double Helix Wine & Whiskey Lounge In Town Square. We have been fortunate enough to have followed Ray Nisi and his Double Helix brand since its inception at the Palazzo Resort in Las Vegas and is a true example of entrepreneurial spirit and hard work. It’s still cold outside and we all could use a little warming up. A fantastic way to get warm and cozy is to head over to Double Helix Wine & Whiskey Lounge at Town Square to taste the new cocktails made exclusively for the holidays and healthy new menu items just in time to help with those New Year's resolutions. We always enjoy sitting at the outside fire pits on the patio, people watch and enjoy some very tasty cocktails. This time of year we came to the right place as Double Helix Wine & Whiskey Lounge has some seasonal libations that are sure to tantalize your palate. 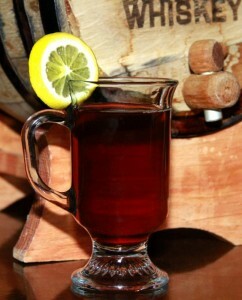 Looking over the list, a warm Hot Toddy made with in-house barrel-aged whiskey and blended with toddy mix, hot water, agave and freshly squeezed lemons is a great choice. An Irish Coffee always hits the spot. This classic treat in a glass combines Jameson Irish Whiskey, brown sugar simple syrup and hot coffee topped with rich sweet whipped cream. 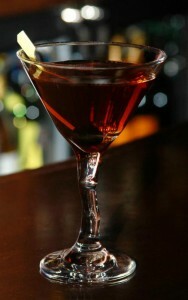 You can’t get more classic than a Manhattan so why not try the Ladies of Bourbon. This dessert variation on the Manhattan is a blend of Basil Hayden's, white crème de cocoa and amaretto chilled in a cool cocktail glass and then topped with a Luxardo cherry to add the finishing touch. 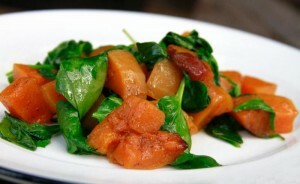 Honey roasted butternut squash, served with baby spinach. Double Helix Wine & Whiskey has assembled a knowledgeable staff and are very eager to assist in pairing a signature cocktail with some of their new menu items. Try the Autumn Breeze, a spicier mix of rye, lemon juice, blackberry syrup and a touch of Benedectine with the “Double Triple,a taste of three cheeses and three charcuterie selections. Other new menu items include Seared yellowfin tuna, with marinated English cucumber, garlic aioli, jalapeno and unagui sauce on toasted lavash or enjoy Porcini crusted salmon, served with sun dried tomato garbanzo stew and spinach or Honey roasted butternut squash, served with baby spinach. For those wannabe mixologists , Double Helix Wine & Whisky Lounge is starting a new series teaching how to make cocktails that will be held once a month at the Town Square location. Each one will have a theme and the first one on Jan. 15 is all about classic cocktails with the Manhattan and the Old Fashioned then the second one on Feb. 12 will feature a White Chocolate Martini and Lemon Drop Martini to represent the sweet and sour sides of love. We will be honing our bar skills starting in January, will you? 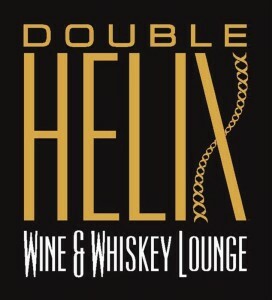 Double Helix Wine & Whiskey Lounge is located at Town Square Las Vegas and open Monday through Friday 3:30 p.m. - close and Saturday and Sunday 11 a.m. - close. 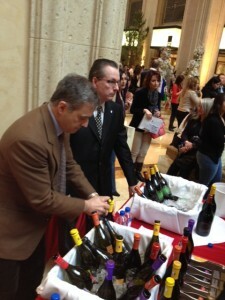 Happy Hour is daily 3:30 - 7:30 p.m. For more information, please call 702.735.9463 or visit doublehelixwine.com. The Palazzo and Venetian Resort's Winter in Venice Festival Shines On The Las Vegas Strip. The Venetian and The Palazzo Resort’s Las Vegas Winter in Venice Festival Brings An All-Star Line Up of Celebrity Chefs and World Class Events. The holiday season is behind us and we all look forward to a successful and healthy 2014. 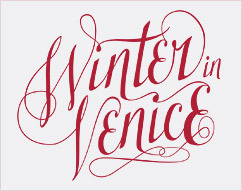 The Venetian and Palazzo Resorts once again ended the year on a very high note with their Winter in Venice Celebration and their best festival yet. This 49 day celebration of food, beverage and culture is an event that should not be missed when in Las Vegas for the holidays. 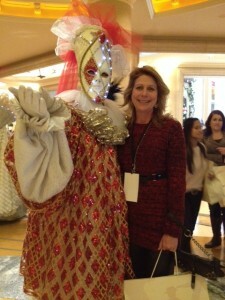 This year’s theme “A Gift of the Venetian” was just that! . It was a 49 day multisensory experience that made history. Guests enjoyed kicking the celebration off with the Celtic Woman, Home for Christmas Symphony Tour. The 90-minute breath taking show featured music and the beautiful, talented women of the all-female music ensemble. Cuisineist Editor-In-Chief Elaine Harris and a Winter In Venice friend . During the 49 day celebration, guests enjoyed two specialty weekends that were a reason to celebrate. 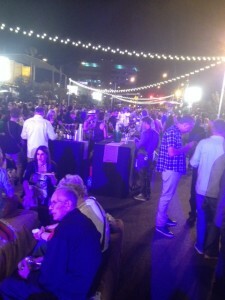 The La Cucina Italiana Weekend featured Chef Mario Batali, Dario Cecchini, Chef Wolfgang Puck, Buddy “Cake Boss” Valastro, Roberto Caporuscio, Anthony Giglio and Robin Leach in conjunction with Southern Wine and Spirits of Nevada. The ultimate dining experience was The Grand Banquet. This mouthwatering Italian experience of a life time was held Grand Colonnade, at the Venetian Resort. Guests enjoyed a gastronomic Italian feast featuring new and old-world Italy, prepared by Mario Batali and Dario Cecchini, the legendary Chianti “Butcher of Panzano.” This one of kind banquet was served Tuscan-style and included such delights as veal Carpaccio, 24-month Galardi prosciutto, risotto with white truffle, and aporchetta created by Cecchini that Chef Batali refers to as “the porchetta to end all porchettas.” Each course also featured a world-class wine pairing by Carmelo Messina and Anthony Giglio to the delight of all that enjoyed this once in a lifetime event. 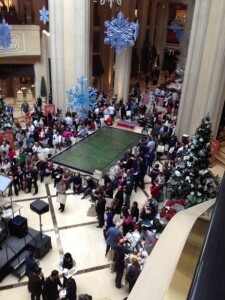 The Palazzo’s Waterfall Atrium was turned into an Italian Village as we enjoyed an afternoon of Food & Fun. Guests strolled the Italian village and took the opportunity to experience Italy and learn about authentic Italy from the world’s greatest chefs and culinary celebrities. 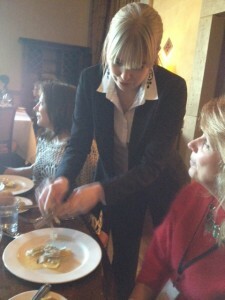 As the afternoon turned into evening many joined Robin Leach at the “Bella Notte” event. This all-star evening was a celebration of Italian-Americans who have made a significant impact on the culture of the United States. Guests mingled, dined and sipped alongside of the honorees as they enjoyed camaraderie and music into the night. The Culinary Clash was back again this year which pitted the best Chefs of the Venetian and Palazzo against each other to vie for the prestige of the Venetian Culinary Clash Award. 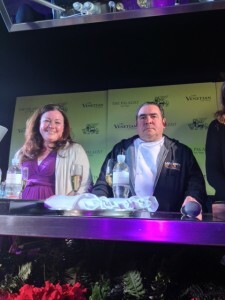 The one and only Chef Emeril Lagasse presided over a judging panel that featured restaurateurs and journalists over a hard fought two days. When the burners were off and knifes back in their cases Chef Tim Doolittle from Table 10 emerged the victor and earned a trip to Italy for his win. The final event of the weekend was The Great Venetian Truffle Hunt. Who wouldn’t want to spend the day looking for truffles, possibly win a trip to Italy and enjoy a lunch featuring renowned Urbani Truffles? We can’t think of anyone. We joined in the hunt that took us to Chef Mario Batali’s B&B Ristorante, Carnevino and OTTO to find the magic truffle that would send us to Italy. After a long night, the last day kicked off with breakfast that included Cipriani-style Bellinis and Italian coffee at OTTO . 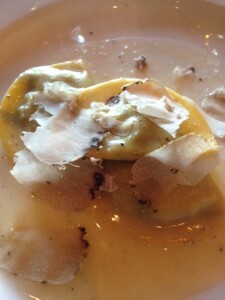 We received half of a golden-colored truffle and the hunt was on as we sampled truffle dishes and wines at each stop. The last stop was Carnevino where one guest found the matching truffle and won an once-in-a-lifetime trip to Italy to visit the famed La Cucina Italiana Cooking School. The afternoon was exciting and delightful. Even though most of the guests did not win the ultimate prize, enjoying a 4 course truffle and wine paired lunch was a tasty way to end the final day of this annual celebration.